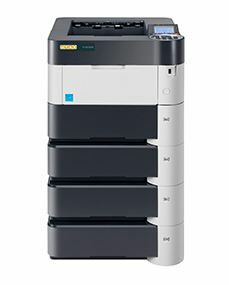 The P-5531DN can be quickly integrated into all work processes and manages even complex office environments. The high paper capacity allows a versatile paper handling – different paper formats from A6 to A4 and various media with paper weights of up to 220 g/m² can be stored in high quantities. Thanks to the high memory capacity the P-5531DN is always well-prepared for every job. Even large print jobs are processed with ease and at an impressive speed. Long-lasting components help to save resources and to protect the environment.